Summary: An easy-to-use bath thermometer that can also be used as a room thermometer. Without a bath thermometer, getting the temperature of your baby’s bath just right can be a dangerous endeavour. Of course, if you run the cold water first before adding the hot, you minimise the risk of scalding your little one, but unless you have an accurate means of testing the temperature of the water, the bath can all too often be too cold or – even worse – too hot. And even when you do get it just the way your baby likes it, after just a couple of minutes the temperature can change. To address this, the internationally renowned child safety brand Dreambaby have developed a bath (and room) thermometer, that checks and rechecks the temperature of the water every 10 seconds, helping you keep your little one warm, but not too warm, at bath time. We got our hands on the Dreambaby® Bath & Room Thermometer and put it to the test. At just four months old, our little one is too young to get much enjoyment from the thermometer, which is styled like a rubber duck, and bobs around on the water. Still, for older babies, and even for younger ones, the thermometer is a good introduction to having toys in the bath and certainly doesn’t look out of place in the bathroom. The flashing red light quickly alerts you to when your bathwater is too hot for your little one. Once turned on, the battery powered thermometer will automatically register a reading when placed in the water, and will turn off after 30 minutes to save energy. A green or red light flashes above the LCD display – green for too cool and red for too warm. When the temperature is just right, no light appears. Whilst this is a great piece of functionality and quickly alerts you to when the temperature is too hot, you could be forgiven for thinking that green signalled a safe temperature – rather than one that is too cool for your little one – so it pays to read the instructions provided on the packaging. With easy-to-use buttons on the back of the duck, you can switch between Fahrenheit and Celsius, depending on your preference, and you can also change the temperature at which the alerts come on. At $17.95 the thermometer also doubles up as a low cost method for keeping an eye on the temperature of your baby’s room – however, it’s worth bearing in mind that the display is on top of the duck, and therefore ideal for the bath, where you’re typically looking down on the display, but less appropriate for the room, where a larger side display would be easier to keep an eye on. Non slip bath mat stickers. They help to stop falls and slips in a slippery bath or shower recess. Do they do what they should? Would you recommend them and why? Yes, because they are functional and fun. My toddler absolutely loves stickers and she sees these as stickers for the bath! They have been quite a hit in our household. There are 6 in a pack – 3 fish and 3 starfish – all of which are very cute. Looks aside, they seem to work too. While it is hard to beat the coverage of a full non slip bath mat, these mini mats definitely have a place. Being nice and compact, if not a permanent fixture, at minimum they offer a perfect travel solution (not to mention something else to play with in the bath)! $7.95 for a pack of six. Visit the Dreambaby® web site at http://www.dream-baby.com.au or call (02) 9386 4000 or New Zealand, call (09) 274 8788. Ideal for locking up medicines, cleaning products, razors and even electrical hair appliances. Dreambaby® has a range of cupboard locks and latches including the perfect for the corner cupboard and drawers that are often installed in bathroom areas. Yes. They are easy to install – no tools or screws – and have worked for us, keeping little fingers out without making it too hard for adults to get in. The test will be whether the adhesive lasts, however so far so good. We have installed them in the bathroom to keep our little one out of the drawers and are already enjoying not having to constantly pick up after her, not to mention knowing that we can store things safety away from her curious hands. Installed on the corner of the drawer, they are quite discrete, and when we grow out of them they should be easy to remove. Visit the Dreambaby® web site at www.dreambaby.com.au or call (02) 9386 4000 or New Zealand, call (09) 274 8788. We have the following goodies to giveaway to one lucky family for the ultimate bathroom safety package to keep your little ones safe. Dreambaby® Mini Suction Mats-F119 are an important addition to any child safety checklist. They help stop slipping and nasty falls in baths or shower recesses. They will also make bath time more fun! Perfect for the entire family! RRP$7.95 for a pack of six. While bath time is actually fun for most children and a great bonding opportunity for parents and their little ones, the family bathroom is also a dangerous place. Most poisonings (from both chemicals and medicines) occur in the family bathroom and children are also at risk from drowning (baths, toilets and sinks all pose a threat) and can seriously injure themselves from accidental falls and slips as a result of slippery surfaces. Dreambaby® Mini Suction Mats-F119 help stop slipping and nasty falls in baths or shower recesses. They will also make bath time more fun! RRP$7.95 for a six pack. Find out what they thought in the comments section below. News Flash – Blind Cords! Thank you to Dreambaby for providing a product for my review! We all know when it comes to kids, there’s a lot of thing you need to have. For most parents safety is tops on the list! I was recently able to work with Dreambaby on a review of several of the products that they offer. About Dreambaby: Dreambaby® is an internationally renowned child safety brand available in more than 100 countries. Our extensive range of products is specifically designed to provide parents and carers with modern home safety solutions that make it easy to help keep children safe in and around the home. Our products are designed to not only help make your home safer, but also to make life easier. I was sent a New Soft Touch Potty Seat, Three Stage Baby Gum & Tooth Care, Deluxe Brush and Comb Set, Grohangers, and a Bed Rail. I was excited to jump in and have my boys be my test subject (like they so often are). Wouldn’t it be nice if you could buy something or receive something that can grow with them. The Three Stage Baby Gum & Tooth Care, & Grohangers do just that! I LOVE LOVE LOVE these items! I usually buy the finger gum brush, and end up getting bit in the process..I love that there are three brushes in the pack, so I don’t have to run out and find an appropriate brush for the stage he is at. The Grohangers are a total answer to my prayers! I get so frustrated when the kids hit that stage where the baby hangers are too small, and the shirts are falling off, and the adult hangers are way to big they don’t even fit in the shirt! The grow hangers have 4 stages, you just extend the hanger to the length you need at the time. Both come in your choice of pink or blue. Their New Soft Touch Potty Seat is great for my little man, The other seats we have purchased have all tried to add a soft top, but he still complains about the hard plastic underneath…because the cushioning isn’t thick enough to keep his bottom from resting on the hard plastic. The soft touch has not hard plastic, but is still sturdy enough to hold it’s shape while keeping Chris comfortable on the potty…and for such a little guy, he sits there for quite a while. The bed rail was something that we have been looking into getting but haven’t because he’s been in a toddler bed (he’s getting a twin for Christmas). I can’t wait to get to put it on his big boy bed! We used it the other night when he slept in my bed with me, and it was so great to not have to worry about him rolling off the bed..he moves around so much its crazy. I love that there are straps attached to the plastic legs that stretch to the other side of the mattress to keep the rail in place. I’ve had other rails that would slide out from under the mattress with all the moving my kids do. I also love the fact that it folds down to make it so easy for them to get in and out of bed…the rail can be folded down when their not sleeping, cause if your kids are like mine, they live in their bed..reading, forts, hide and seek…then with just a simple lift it’s back up for bed time. There is a latch to keep it up, you just simply lift the latch on each end when you want to fold the rail down. Disclosure: I have received a product(s) for review purposes only, however I only recommend products or services I use personally and believe will be good for my readers. Dreambaby has not influenced the editorial nature of this post, and No other compensation was received. Please see our disclosure policy for more information. 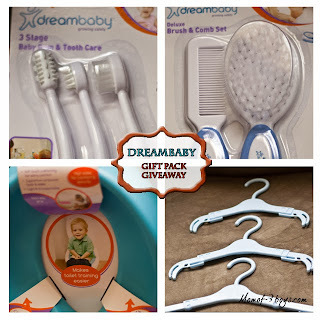 Now is your chance to win a 4 pack of goodies courtesy of Dreambaby! For your chance to win fill in the Giveaway Form Below! Good Luck! This is a baby gate which separates children from areas in a household where they shouldn’t go. It sits across a doorway and is secured on either side by winding mechanisms which hold the gate securely into the door frame. It creates a physical barrier between the child and entry points into other rooms in the house. The gate fosters a sense of security for parents who want to keep their child out of a particular room where there may be safety risks such as the kitchen or the bathroom. The gate we tried was initially too small for the door frame we wanted to place it but after receiving the extension pieces and fitting them on either side of the gate, it fitted perfectly. My husband said that when he put it up it felt “intuitive” and he didn’t need to check the instructions on how to do it. The gate is “pressure mounted” so you don’t need to drill anything to fix it in. It did take us a couple of tries to work out you don’t need to physically lift and close the latch yourself and it really is a self closing mechanism. This is great for when your arms are full of baby or groceries or washing or any other hundreds of things we mums carry every day. When our baby is asleep we just leave the gate open and this makes it easier just to walk through. I liked the fact that the gate is tall and will last until our baby has grown older and he can go into any room of the house without us worrying. The gate also looks good. We live in a modern house and I like the fact that it wasn’t wood and it’s streamlined and fits with our furniture. Absolutely I would, I’ve already told the mums in my mother’s group about it. The only perhaps negative thing I could say about it is that the opening you walk through is pretty narrow. I’m not very big myself so it didn’t bother me but my husband has to manoeuvre himself a bit when he steps through it. But to be fair, I don’t know how you’d get around this. There has to be enough strength in the gate either side to make it secure enough so it stays up and there are safety standards to stick to. Another thing I really like is the fact that the gate opens both ways so no matter what side you’re approaching it opens and closes. I know this sounds basic but it really helps the gate to be more user friendly.